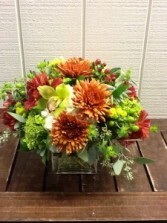 A fall mix of green and bronze hues bring this 5x5 clear glass cube into focus. 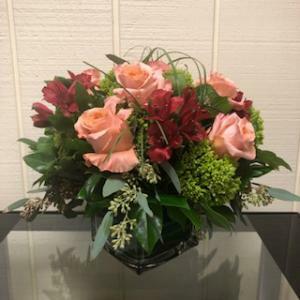 This attractive Fall arrangement is filled with green hydrangea, bronze cremons, green cymbidium orchids, mixed autumn greens, berries and more. 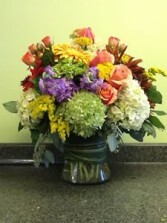 A wonderful surprise for any occasion! 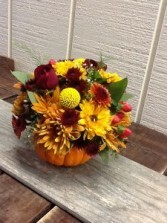 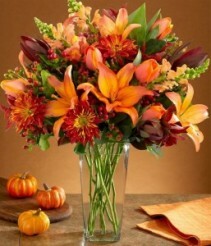 Fresh Pumpkin base with a fresh flower arrangement in fall tones. great way to decorate for a fall or halloween party. 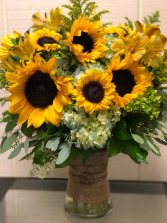 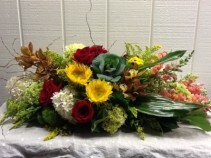 A large long and low lush centerpiece arrangement overflowing with Hydrangea, Roses, Sunflowers, Cymbidium Orchids,Ornamental Cabbage,Snapdragons with a mix of different foliage. 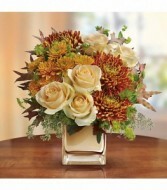 Perfect for Thanksgiving or that special dinner party or host gift, Put this on your Thanksgiving list. 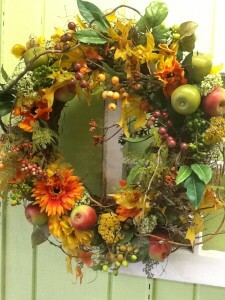 This beautiful silk and dried fall wreath is perfect for indoors and out. 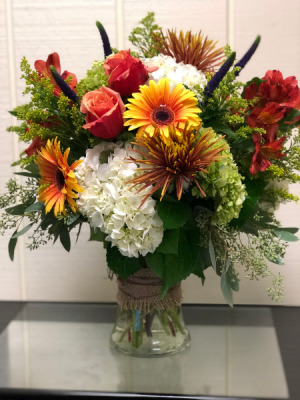 At 20" end to end fits most home doors, bright colors of autumn leaves, fruits, flowers and berries make this a complement to any home decor. 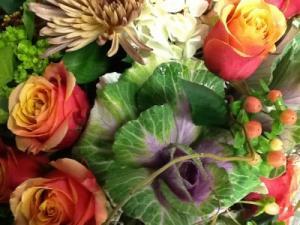 Fresh Fall seasonal flowers put together by one of our talented designers using only the freshest and finest blooms.